In Part II of our series marking the centenary of the birth of Paul Keres, Joosep Grents looks at how the 20-year-old Estonian star dazzled the 1930s chess world with a series of spectacular games. In Part I we saw how Keres established himself as the Estonian no. 1 and burst onto the international scene at the 1935 Olympiad. In only the next two years he was an Olympiad gold medallist, supertournament winner and strong contender for the World Championship title. Relive that era, with great games and quotes that will have you comparing those players to the current chess elite. Alekhine has just played 36.b7 - is it game over? Alekhine tried to take advantage of an initiative from the off. That led to a dynamic endgame filled with tactical nuances, a type of position in which the now ex-World Champion excelled. However, Keres also preferred such positions to those requiring dry defence. A cold-blooded tactical sequence allowed him to steer the game into a completely drawn position. In the diagram position there followed 36...Nd8! 37.Bc5+ Ke6 38.b8=Q Nc6+! 39.Bxc6 Rb1+ and the queen was removed from the board. In his first individual international tournament Keres posted an impressive performance, not losing a single game and finding himself in the sole lead after beating Stahlberg in the last round. Alekhine was struggling to find a way to beat a German underdog, putting Keres on the verge of a perfect tournament debut, but the underdog finally succumbed, allowing Alekhine to join Keres on 6.5/9. It is beyond doubt that (Keres) is a promising young player with extraordinary knowledge for his age, however the epithet “brilliant”, which I was quoted as having used, is based on a mistranslation. A diamond shines flawlessly, but Keres was at best still a raw gemstone with an uneven glint. Nobody could have predicted what the refinement process would bring. Over the course of nine rounds, Keres once blundered a piece, twice went on wild goose chases that left him playing endgames a pawn down, played a risky opening and ended up in a bad position, and twice was able to get an advantage out of the opening (although he lost the advantage in one of those games). The final tally: five “spoiled” and one bland game. However, he hit the jackpot on three occasions: against Alekhine, Vidmar and especially Stahlberg. Keres’ next tournament in Dresden showed how that recklessness could backfire. You can only imagine my joy after Bad Nauheim. However, the pressure proved to be too much for a player lacking in experience. And the reaction came two weeks later in Dresden. First a loss to Stahlberg. A promising win against Grob was then followed by a cascade of losses to Alekhine, Engels and Helling. After draws against Bogoljubov and Rödl, the win that followed over Sämisch was little consolation. 3.5/9 and 8-9th place in a 10-player field. The world of chess was confused: which was a bigger surprise, my success in Bad Nauheim or my failure in Dresden? I prefer to believe the former. My brother's youthful performances have often been analysed and criticised, and his temporary setbacks explained away as the frivolity of youth. This is not right. By what logic can we expect a young, inexperienced person, whose upbringing took place in the yard of a rented dwelling in Narva, and who then found himself totally alone in international company, encountering gentlemen like Capablanca and noblemen of the calibre of Alekhine... to behave as an equal partner in this environment? Lately it has become clear that the best tournament players have been Reshevsky and Fine, both avoiding refined opening theory and exhibiting the triumph of common sense over flashes of ‘creativity’. The main subject of discussion in Zandvoort was determining the style of Fine, whose wins are somehow unnoticeable, while he saved his other games with numerous daring salto mortales. The experts were finally able to conclude that Fine's style is based on the lack of one. This reminds us that in the context of the world chess scene, Keres was merely a drop in the ocean of promising young players, amongst whom he perhaps remained the most mysterious or unpredictable, following these results. The youngsters met the elite in Nottingham in 1936. Not only did the field in Nottingham feature three ex-World Champions (Lasker, Capablanca and Alekhine), the reigning World Champion (Euwe), but also the aforementioned Fine, the resilient Reshevsky, the pragmatic Flohr and the World Champion to be: Botvinnik. The young generation, led by Botvinnik and followed up by Fine and Flohr, proved they were not to be taken lightly. Botvinnik won the tournament by drawing with the top half of the table and getting +6 from the bottom. Despite sharing ten points with Capablanca, he beat him on tiebreaks due to having no losses, as opposed to Capablanca's loss to Flohr. The young generation was full of surprises, and while Keres might not yet have been part of the elite, he was preparing some surprises of his own. There was considerable uncertainty when it came to the Olympiad in Munich. The Nazis did all they could to make the event serve their ideology, but they were unable to persuade the English to move the schedule of the Nottingham event and thus the true elite were at Nottingham while the rest faced each other in Nazi Germany. That is, if the latter decided to participate. 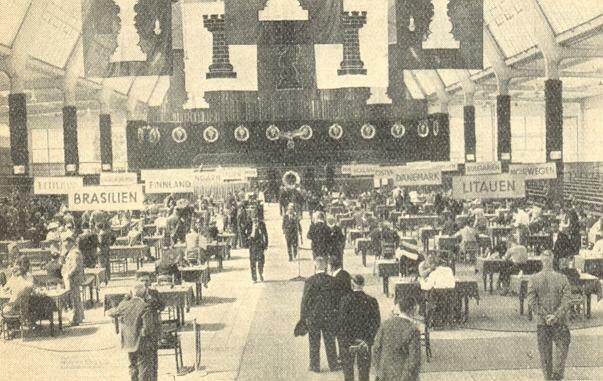 FIDE did not recognise this as an official Olympiad, but did not boycott the event either, as the Nazis lifted the ban on Jews for the time being, and FIDE thus left every federation to decide for itself whether to participate or not. For some players, though, it was a matter of principle. 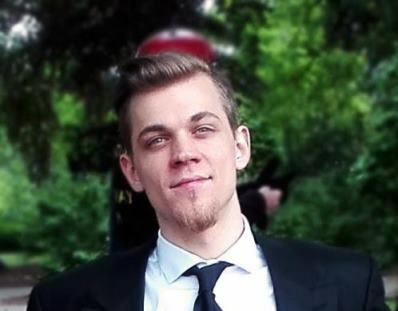 Spielmann refused to participate and declared publicly that his dignity and discretion do not allow him to play in a location where he meets only temporary tolerance. The Estonians, meanwhile, were troubled by their usual issues of a less political nature. Uncertainty with regards to participation endured until a week before the start of the event. With the finances sorted out, "Uudisleht" then reported that the Estonian team had the head of a lion, but the tail of a mouse. This was not a mere exaggeration, for instead of the regular four boards, Munich featured matches on eight boards and the second strongest Estonian player, Paul Felix Schmidt, had to stay home due to health issues. With the elite in Nottingham and a substantial amount of players boycotting the Olympiad, one could hardly expect it to be a feast of the best chess masters. However, despite the lack of quality, the Nazi ideology dictated a necessity to impress the outside world. Accordingly, the hosts went out of their way to awe the participants, with the extravagant nature of the event not lost on the numerous delegations: extensive fireworks, excursions, performances, shows and receptions were unleashed to numb the minds of those who were there to stay sharp at the board. Those who took part in the event later admitted to never having witnessed its like before. The tournament itself saw the lion roar in the playing hall, as Keres won individual gold on board one (15.5/20), with some fine games, including Keres 1-0 Richter, 1936, where he perfectly calculated a long endgame sequence that won by a single tempo. It was during the Olympiad in 1936. He was 20, I was 25, and his fame had already reached me the previous year. I admired the game Keres vs Winter, 1935 in which Keres was so elegantly able to convert his opening advantage into a win. After this example, and not having met him yet, I imagined a thin, quite serious gentleman, whose suggestive eyes would reflect his rich fantasy. However, what I was able to confirm after seeing him in Munich for the first time was only that he was thin. I met a cheerful and a vivacious young man, who in the company of his Estonian team gave me the impression of a wise-cracker sort of a guy rather than a serious chess master. Such a view did not last long. The next day I saw him behind the board and his cheerfulness had completely disappeared: he had transformed into a serious chess player who went on to beat the Hungarian Lajos Steiner in an excellently executed endgame. Despite the lion's roar, the tail tallied a sobering 10th place for Estonia among 21 participating countries. Hungary triumphed with 20 wins in a row, something which wasn't repeated until 1960. After the Olympiad and Nottingham, the world chess scene, and Keres with it, became relatively quiet. Keres stayed at home for the next half a year, but that calm was merely the eye of the storm. Young men should not be afraid of a lack of energy, but their lack of experience, and not one of the players invited to Semmering had less experience than Keres. This decision not only benefited himself, but also enriched one of the most wonderful years of chess. When the game between Alekhine and Buerger was adjourned, Alekhine went for some whiskey and then resigned. The irritated man then said: "The next seven rounds will show if I can afford to give an extra point to Fine”. Before clicking on the link above, can you spot Keres' famous winning move? In a difficult position Alekhine has just played 22...Qb4? The extraordinary combinational ability of Keres left a deep impression on all the participants. If one takes into consideration that he is merely 21 years old, then one can certainly foresee his future fame. The only factor that speaks against him is his modesty. No player with aspirations of becoming a World Champion has ever been known for this characteristic. A lucky guess, or a prophetic insight? The participants are for the most part relaxed, maybe even too relaxed. They live in an exquisite hotel and act like noble guests. Everyone can spend time in a free-for-all casino, where one can become a millionaire from a mere five franks start. The numerous open-all-night taverns constantly attempt to beat each other with the lowest prices. Living here is beautiful, but tournament play is not easy, especially for up-and-coming grandmasters. In the fourth round I achieved a brilliant position against Grob, then lost a pawn for nothing and ruined my position. However, I still somehow managed to equalize, but then I lost on time! Grob was in time pressure just before the time control on move 51, but he handled it well. Then I had about 20 minutes to make my 51st move, but I forgot that I needed to make one more move and I lost on time! After tying for first with Grob and Fine, Keres then went on to Prague and Vienna, both of which were lower rated tournaments. The Czechoslovakians were eager to see the ‘Northern Miracle’ (“Česke Slovo”) and at the opening ceremony of the tournament even attempted to welcome Keres in Estonian. Keres returned the courtesy and scored 10/11, only drawing with his friend-to-be Karel Opočensky and Sonja Graf. He differed greatly from the other participants. He surprised everyone with his modesty and concentration on the game. He did not care for entertainment. With this, he impressed both the players and spectators. Another puzzle - can you spot the elegant move and idea that caused Karel Hromadka to resign, since mate is inevitable? The chess family of Vienna was able to witness the play of one of the most intriguing chess personalities. He is modest. But his games! It is beyond doubt that he possesses the greatest tactical ability, most natural frenzy and most invigorating play of all the living players of our time. These are the same characteristics which had the chess world in awe of Paul Morphy (the same first name). Such men invigorate new chess followers a thousand times more effectively than the 'safety-first' players whose results might be more consistent. The highest epithets were not thrown around without reason. 1937 had so far seen Keres win all the tournaments in which he participated. The comparisons with Morphy were a result of his style, which contrasted to that of many other players at the time. As mentioned earlier, Fine was speculated to have no particular style or stylistic preference, while another particular stylistic contrast was provided by the Czechoslovak giant Salomon Flohr. A chess player of our time has to foresee the plans of his opponent, uncover tactical combinations, make use of microscopic advantages and understand the dynamics of chess. This is not a mere question of professional technique. I find it a lot easier to calculate a ten-move forced sequence than to find the only correct move in a strategically plain position. This endgame would never have been played if it had occurred 20-25 years ago and would have been called a draw. However, I was able to demonstrate that by using the achievements of modern technique this endgame is winnable. For the admirers of ‘Immortal Games’ such a game might be worthless, or seem the most boring of all chess studies. However, Alekhine identified this almost as the peak of the modern game. Flohr is a statistical player who knows that in a tournament with a certain number of participants, he needs a particular number of points. For this he has to prevail against the weaker players and drop half a point to the stronger and, above all, exploit every possible opportunity. Such chess might inadvertently appear boring to many, but that is not the case. Flohr's game is full of elegant strategic nuances, minuscule drama and glorious examples of how to convert winning positions into wins. The ideal that once was characterised by spectacular tactical play will give way, and has already given way, to the ideal of perfect technique. Keres is the most admirable phenomenon in chess at the moment. In one and a half years he has produced a quantity of brilliant games that few could manage in a lifetime. The Keres oeuvre defies categorisation. He stands alone, without predecessors, and all who attempt to copy his style will fail to do so without getting punished. In future ‘Paul Keres’ will be written into the history of chess with golden letters, yet there will be no school of Keres. He alone can play in such a neck-breaking style where everything appears to be hanging by a thread, yet despite appearances every eventuality has been accounted for! In the games of Keres there are moments where other masters would crash their ships on the rocks, situations that have been pushed to the limits of absurdity. When you play through those games you will get the impression of a preposterous dance on the edge of the abyss, but once you analyse them dispassionately the logic and ingeniousness of Keres suddenly strike you. A man with such passion is a true chess Paganini who can play his devilish melodies on just one string. Keres is not only an ingenious tactician, but he has also not forgotten the true value of positional play. During the first years of his career aggression was the dominant element of his playing style, but very soon he managed harmoniously to intertwine strategy and tactics, allowing him to defeat the greatest players of his time like Alekhine and Capablanca. Be that as it may, the journalists continued to consider Keres the unique representative of Alekhine-like poetic play, as someone always able to bring tournaments to life. 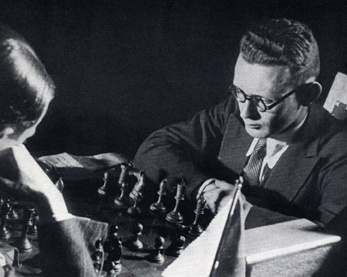 While he might have not agreed with such a representation, it is beyond doubt that Keres’ early games exhibited aspects reminiscent of Alekhine's style. The same might be said of almost every talented young player, but maintaining that style and continuing to play stunning attacking games which enthuse the public imagination is something few can manage. The real tests began in Kemeri, Latvia. The field of 18 players included names such as Alekhine, Euwe, Reshevsky, Fine, Keres, Tartakower, Flohr, Steiner and Petrovs, making up a fierce field of competitors with no clear-cut favourite. Petrovs did not consider Keres capable of finishing in the top four, based on the fact that Keres had so far participated in lesser tournaments with one to three clear favourites in a weaker field. Alekhine claimed his rivals were Fine, Flohr, Reshevsky and Keres, with the latter singled out for his interesting style - but which style would prevail? Alekhine now drinks milk and eats chocolate. The board is no longer filled with unfinished cigarettes. The ex-champion was clearly motivated to get into the best shape possible in order to regain his throne from Euwe in the upcoming match. As Keres started to improve his tournament position, news reached Latvia that the Dutch Chess Federation had announced plans to arrange a Candidates Tournament in 1938 to decide the World Championship challenger. The field of eight players had been announced and included Keres. Such recognition surely boosted the motivation of the young Keres and saw him climb to 7/11. The surprise of the tournament was perhaps the local hero Vladimirs Petrovs, who shared second place with Flohr after 11 rounds on 8/11. Reshevsky was still in the lead with a superb 9.5/11. In the 12th round Keres played an interesting rook sacrifice against Steiner and managed to catch Alekhine at 8/12. The tournament started to heat up. A battle of words at the Kemeri tournament. 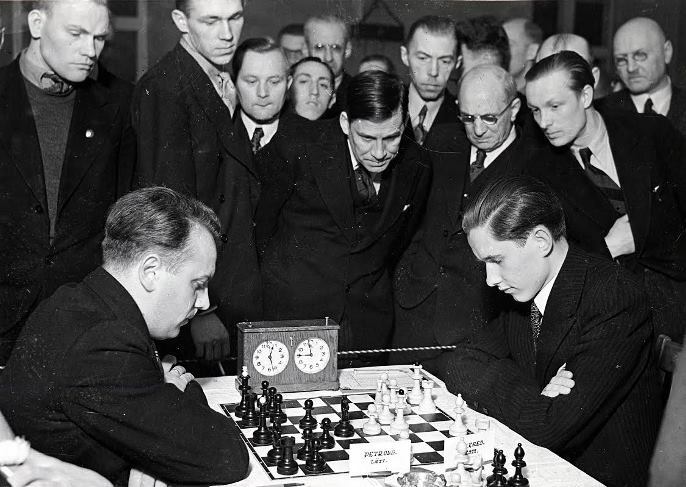 Alekhine to Flohr: “So that you will not finish second here in Kemeri, I will only play for a draw with Petrovs tonight”. He then grabs a pen and marks his upcoming game with Petrovs as a draw on the tournament table. Tournament organizer Kmoch quickly erases the draw from the table and cautions Alekhine. The reason? Böök had not made a move in his game against the ex-champion and waited for the game to be adjourned – he did not want to ruin his drawn position – so he walked around the hall instead. Alekhine then poured out his anger on Flohr. The way Keres treats some of his games is occasionally too careless, which often results in the threat of losing. Yet it appears as if he gives these chances to his opponents out of mere playfulness... He loves danger. After about a year or two of steady development the world could have a genius to bow down to. His style certainly continued to attract praise, despite the occasional mishaps. However, was it enough to win in Kemeri? Over the course of the rest of the tournament Reshevsky's sprint lost momentum and before the last round the winner was still unclear (1st Reshevsky 12/16, 2nd-3rd Flohr and Petrovs 11.5/16, 4th-5th Alekhine and Keres 11/16). Reshevsky, who had led the tournament throughout, then pushed for a win against Böök and his unnecessary risk resulted in a loss. Petrovs and Flohr faced each other. Flohr's style dictated a draw, despite the game being well-fought. That meant that if Keres or Alekhine were able to beat their inferior Latvian opponents the tournament would see first place shared among five players! However, neither Alekhine nor Keres was able to beat his Latvian counterpart and both settled for draws. 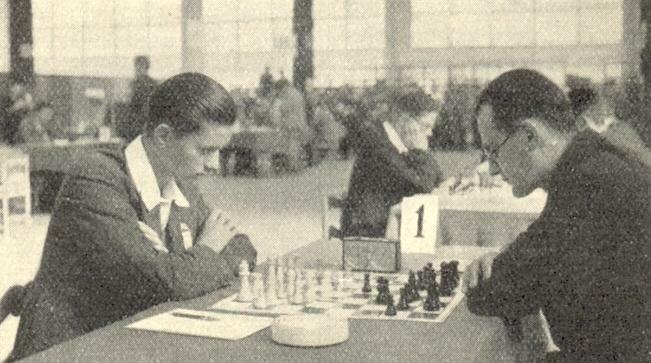 The first place was then shared between Flohr, Petrovs and Reshevsky. Flohr's statistical style had not let him down. Draws with the top 10 of the tournament were boosted by 7 wins against the bottom of the table and saw him soar to victory. Had Reinfeld been right after all? Young Keres was a mere half a point from shared first place. However, the fact that this result is considered poor merely shows how high the evaluation of Keres really is. After Kemeri, Keres and Flohr traveled to Pärnu along with Tartakower, Opočenský and Stahlberg. The provincial town suddenly buzzed with excitement as never before, as the visitors were joined by locals Schmidt, Raud and Villard to play a tournament of unprecedented strength for the location. And that buzz soon turned to bravos as the two Pauls took the first two places, though not in the order expected. Paul Felix Schmidt had beaten both Flohr and Keres to clinch first place, later commenting, “My success did not strike me as surprising”. This result greatly boosted the Estonian Olympiad hopes, as Stockholm, which was now just around the corner, would see Estonia sending two strong GMs. Juan Antonio Samaranch – the former IOC president – would traditionally praise almost every Olympics as “the best ever”, so it’s no surprise that Olympic organisers strive for that praise. While not being accepted as part of the Olympics, the Chess Olympiads are no different in this regard. And while the Germans had pulled off an unforgettable feat, Stockholm had no plans to be one iota less of an event. We have to speak plainly and admit that every earlier effort has been exceeded. It is obvious that all the other host nations are hospitable and put their best efforts into offering the best to their guests, but one must not forget that Sweden is not only a beautiful but a happy land, untouched by war for nearly two hundred years. Finding food, shelter, social order or employment is easy, so nothing has been allowed to hinder an increase in social comforts. The 11th and 12th August have their own meaning. They mark that time of the year when stars fall from the constellation of Perseus. The current year saw a record breaking amount of stars falling, but on this occasion the stars did not only fall in Perseus, but in Stockholm. Not only did stars fall, but whole constellations. This is a new notion in astronomy. Thus Finland beat Estonia 3.5-0.5. In the end Estonia came 7th as the Americans triumphed for the fourth consecutive official Olympiad (excluding Munich). Keres took individual silver on the first board with 11/15, while Flohr won gold with 12.5/16. However, Stockholm was not only relevant in terms of the chess played on the board but the chess to be played in the proposed AVRO tournament. A FIDE Congress was held in Stockholm to reach a decision on the matter, and while everyone was expecting the World Chess Federation to welcome the opportunity with open arms, nothing of the sort took place. The Candidates Tournament concept was voted down with 4 in favour and 8 against. 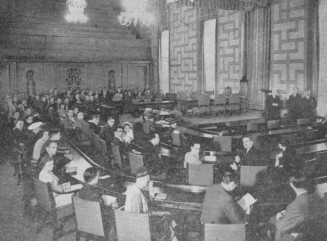 It was then decided that the challenger would be chosen immediately in Stockholm by a vote. Classic FIDE! The vote had two rounds: the first round had five candidates (Botvinnik, Capablanca, Fine, Flohr or Keres) while the second was between the top two scorers from the first round. It was expected that Capablanca would be the natural choice, but the result left Capablanca fans utterly dejected. Flohr – 6 votes, Capablanca – 4 votes, everyone else – 1 vote. The Czechoslovak player then took second round victory with 8 votes to 5. FIDE had thus chosen an official challenger for the winner of the upcoming Alekhine – Euwe rematch by a simple vote. Euwe, Alekhine, all the “candidates”, welcomed this wonderful proposal (from the Dutch Chess Federation). The whole chess world would have welcomed it with open arms. The reasons for this crassly stupid decision are hard to find. You can send ten very wise men into a committee room and they may make a very stupid committee. Invoke the curse of Babel and the confusion is intensified. Add a group of men whose heads are slightly puffed by the positions they have attained, and who are spitefully jealous of any scheme to which their own name is not affixed, and you get results like this. …It is almost superfluous to add that the FIDE, still floundering like an inebriated elephant, managed to reject Capablanca’s claims as official challenger in favour of Flohr’s. Get better men! Mr Rueb and his delegates are not gods. If a labourer makes a mess of his job, he is sacked. If an engineer makes a bad blunder, he loses his job. The present FIDE is obviously incompetent. We should sack the lot! Everything with regard to that decision is unintelligible and shocking. In particular, the rush. After all, they could have waited for my match with Euwe, on which so much rests. However, there was one man in this whole mess who remained silent. On such occasions he always preferred silence. 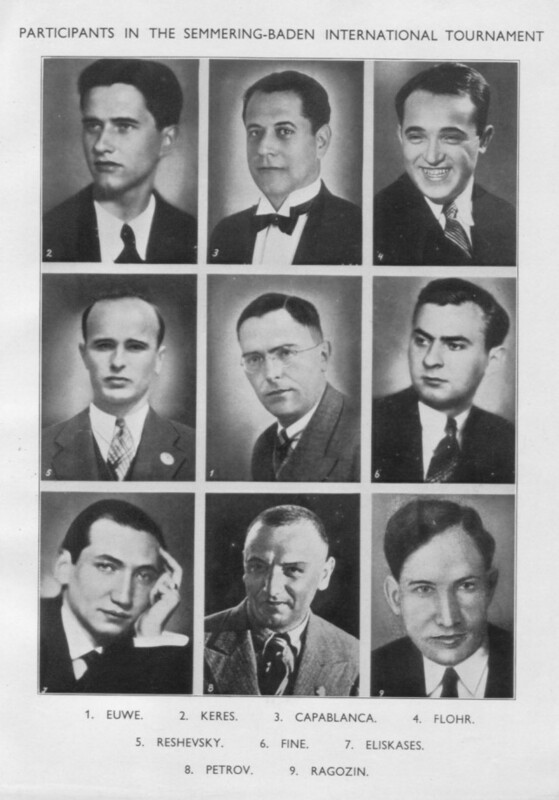 After failed attempts to organise a colossal tournament, the Austrian organisers settled for a clash of eight: Capablanca, Eliskases, Fine, Flohr, Keres, Ragozin, Reshevsky and Petrovs. Semmering must show who is the most vigorous grandmaster. Although I do not think Capablanca will be able to win, I regard him as a more suitable challenger than Flohr... Despite this, the main favourite in Semmering is Flohr. His deep and solid style is the best guarantee... Keres is an artist. His fantasy allows the creation of the most fascinating tactical combinations, but he does not play solidly enough. He will not get ahead of Capablanca or Flohr with his sacrificial combinations. It is in Semmering where he has to take his exam to prove his readiness for a potential World Championship match. I went to Semmering without much hope of a major success, as my relatively limited tournament experience meant that I had no real hope of fighting on a level footing with such names as Capablanca, Reshevsky, Fine and Flohr. 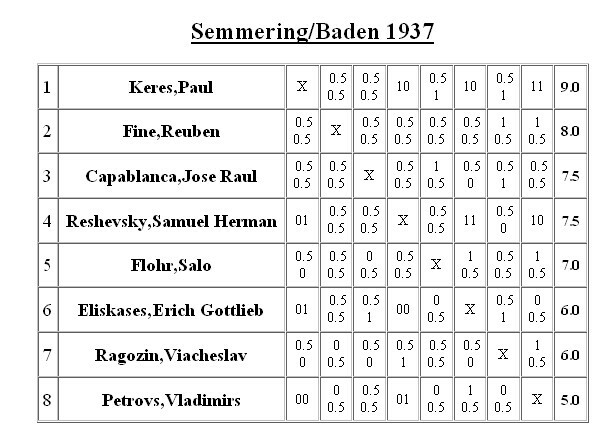 One has to take this assessment with a grain of salt, but it’s true that Semmering was first and foremost expected to play out as a duel between Capablanca and Flohr. The game between Keres and Flohr first developed slowly, that is until I sacrificed my bishop on f3, hoping to achieve a quick advantage. However, my long calculations were faulty, so that instead of achieving an advantage, I lost a bishop and a knight for a rook and two pawns. My position became miserable and I lost another pawn. I then started exploiting every possible opportunity that White gave me, and with Flohr not finding the best moves I soon reached a drawn position. According to the tournament committee, this was the most beautiful game of the tournament so far. This gave me new courage and energy, and in the following four rounds I played a series of my best pre-war games. 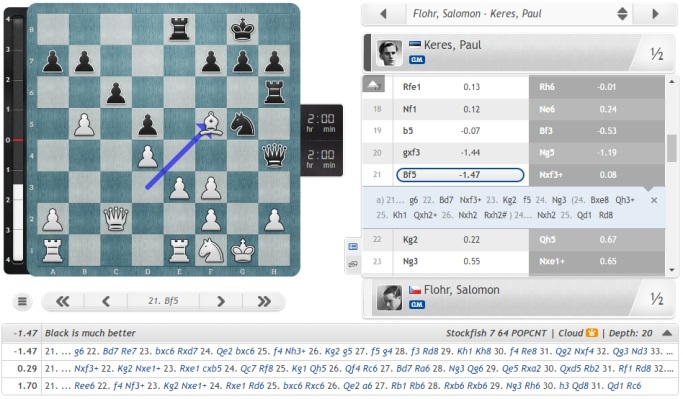 Indeed, the “solid” Flohr found himself utterly crushed after a brilliant 20th move by Keres. Even at this tournament I was unable to rid myself of the careless approach that I had so often had in decisive games. Nowadays I would have played calmly in such a situation, or at least not opted for sharp attempts at victory. But what did I do back then? In the next round Eliskases played for a draw with White, but instead of accepting a draw I decided to opt for risky play for a win and was soon forced to concede my first defeat of the tournament. And after a subsequent loss to Reshevsky, I was forced to put great effort into keeping Capablanca at bay in the last round to ensure first place. All of this was, however, quickly forgotten, for the final table spoke for itself. Šachový Týden joked that the duel between Capablanca and Flohr had been won by Keres. Furthermore, Keres was the focus of everyone's attention and praise not only due to his own result, but the results of the other favourites, as they had drawn the great majority of their games (Fine 12 draws out of 14 games, Capablanca 11, Flohr 10). Keres never cares about the name of his opponent. He plays in exactly the same fashion both against Capablanca or a third tier player. He loves to play chess, as a kitten loves to play with a ball of thread. Other masters breathe a sigh of relief once the game finishes, while Keres would happily play again. Such a love of chess is one of the reasons for his brilliant performances, but also explains the several tough moments at the final stages. He is a pleasant young man, his victory is very popular. He is even liked by his colleagues, other masters. Could we invite him to the US? The situation in the chess world has turned upside down following the victory of Keres. 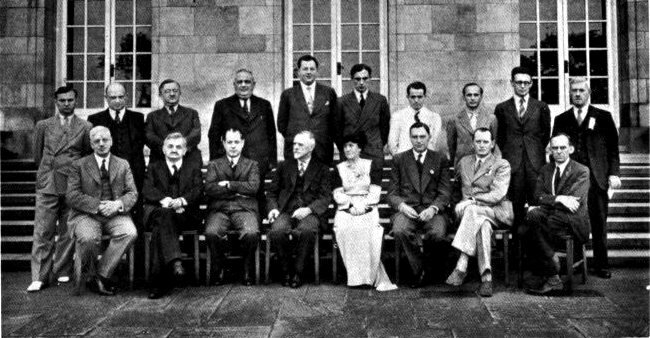 The World Champion is Dr. Euwe, the current challenger is Alekhine, the official challenger is Flohr, the moral challenger is Capablanca, the most fitting candidate is Botvinnik, and the future challenger is Keres, who has won the sympathy of the chess world, for he can play chess better than all of them. Surely Keres. I have to admit that I did not appreciate him much last year, but he has grown and matured to such a degree since then that he is now the greatest hope of the young generation. I believe Capablanca seconds this assessment. Keres and Botvinnik! However, the play of the former is more enterprising, livelier and more likeable. Keres is indeed a very interesting, subtle and talented player. It is too early, though, to speak of him as a clear contender for the World Championship title. Let's hope that he will solidify his play, for only then is he capable of offering us any permanent value. You might be surprised that while praising Keres I am also setting demands on him, but after all, I have encountered many masters during the course of my career who the journalists would refer to as a ‘young genius’, a ‘brilliant tactician’ or a ‘future World Champion’. Yet what did they achieve in practice? It is fascinating that even in his best form, Keres still faltered in the last rounds, or ‘became careless’ as we are told. ‘Carelessness’ was not merely a word employed by the scandal-seeking journalists, but by Keres himself. And in a situation where even the most hot-tempered people would likely have adopted a solid approach, Keres went crazy. What could be the cause of this? Deeper psychological reasons? Heuer puts the question out there, but no definitive answer is forthcoming. Given the Candidates Tournaments which followed later in Keres’ career, isn't this the ultimate question?